While I am certainly very grateful to the team of authors of Lead pollution recorded in Greenland ice indicates European emissions tracked plagues, wars, and imperial expansion during antiquity, it is curious that the only quantitative part of their study was coming up with the lead pollution curve. All the comparisons between the lead curve and historical events in Rome and elsewhere in the Western Mediterranean were entirely qualitative. Yet the greatest strength of employing quantitative proxies results when we examine different proxies against each other. In this second installment of the series (first installment here) I will compare the lead curve to a quantitative measure of building activity in Rome. I will focus on religious buildings (pagan temples and Christian churches), because they typically represent a substantial investment of resources and because they can be often accurately dated. I have used this building index in several case studies described in Secular Cycles. For this post, the list of temples was taken from Richardson, L. 1992. A new topographical dictionary of ancient Rome. Johns Hopkins University Press, Baltimore; and churches are from Ward-Perkins, B. 1984. From Classical Antiquity to the Middle Ages: Urban public building in northern and central Italy, AD 300-850. Oxford University Press, Oxford. The tan vertical bars tell us how many temples (or churches) were built in Rome in each decade. 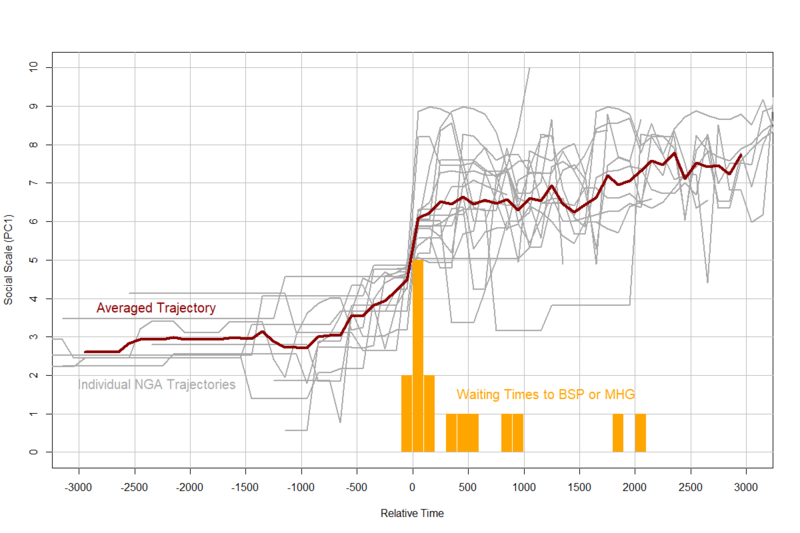 The thick brown curve smooths over short-term fluctuations, helping us to visualize longer (secular) dynamics. 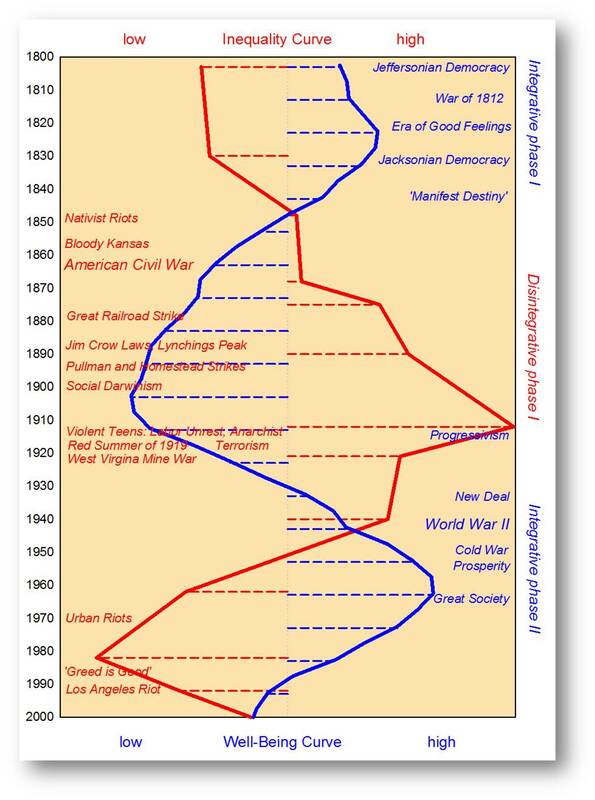 As we see, the curve generally traces out the four secular cycles in Roman history. One partial exception is the building activity gap in the middle of the first century, which divides the Principate cycle into two phases. One possible explanation of this interruption is that there was a short-lived outbreak of internal violence during the first century (the deposition of Emperor Nero followed by the Year of the Four Emperors). What we see is that there is a lot of difference in detail. But there are also shared features. 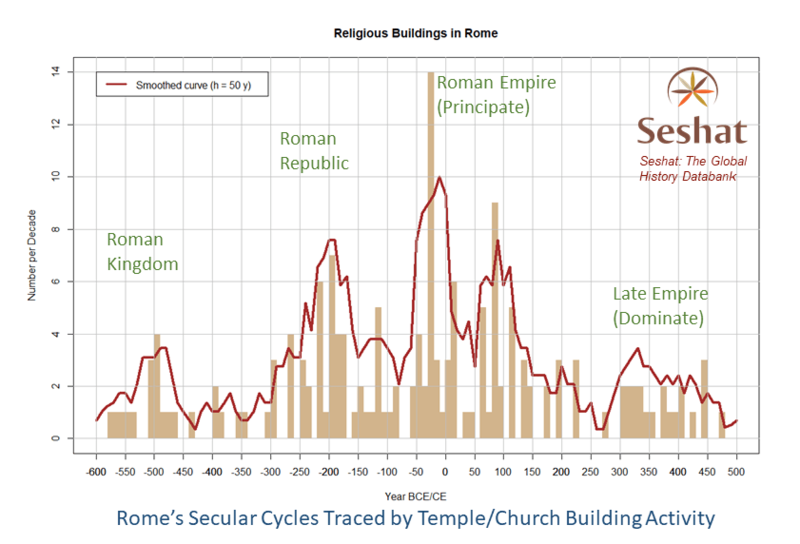 The secular cycles in both curves tend to have peaks and troughs at roughly similar times (except for the “double-headed” Principate cycle in the building data). Additionally, the overall heights of each secular peak are similar in the two curves. The overall correlation coefficient is a respectable 0.62. This is not a bad result, considering that the two curves were derived using completely different methodologies, and that they reflect very different socio-economic processes. 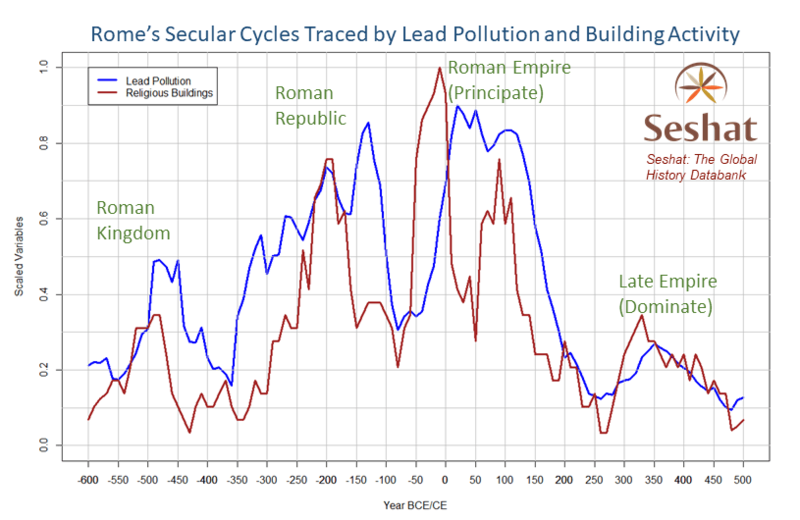 On top of that, the first cycle in the pollution curve is not even due to Rome, since the mines during the early period were operated by the Carthaginians. if trump is nero, shall we expect 4 presidents in a year? But we may have something similar: all the staff turnover in the Trump White House so far. Complete with such discord as former staffer Anthony Scaramucci’s rather vulgar assessments of his colleagues. Checking on Wikipedia’s List of Roman Emperors, 69 CE was a rather unusual year, because most of the emperors before Commodus had reigned several years and died of natural causes. Commodus was murdered in the last day of 192 CE, and the next year became the Year of the Five Emperors. This was only the beginning of nearly a century of instability. Many emperors were murdered, and that era included the Year of the Six Emperors: 238 CE. That’s almost possible after the midterms if Democrats impeach Trump and then Pence. What I find surprising is that the slump of the first century coincides with the rule of the five good emperors. So the good emperors weren’t quite so good? i think what this shows is that we don’t know quite much about the dynamics of the economy during this time – it seems to have been of some cyclic nature, but it does not seem quite easy to correlate them with what actually happened – is an era of expansion good for the economy or does it only enrich the elites? No idea. It depends where the expansion is related to. Very often a material economic expansion, because of its internal efficiency like waterways, roads and markets/ leads to a most thought of political next expansion, which could be military campaigns, leading either to more money expansion through taxing other cultures/ or to evaporation of money, like what happened when northern Europe was conquered. One thing led to the other. So, economic expansion can be either good or bad. There is a correlation between the owners of labor, who receive the most money/ and them deceiding what to invest it in. This becomes the senate of elites/ but can also be individuals buying prostitutes and dancers fi. So it depends on their next thought level. If the military elite promises to gain more money by taking over the administration of other states, this is economic expansion for them. It follows the same route. Control the administration/ and you earn more money. However when this administration is poor/ you will keep on loosing money. The promess is postponed/ but in the meanwhile the people adore their military leaders. They send their sons out to the promised land. Expansion inverting itself into implosion. Who’s fault it is? That is very interesting. Just by inspection that looks like a close correlation, which suggests but does not by itself establish causation. Have you calculated the correlations coefficients (R and R-Squared) for these curves? Sorry, I just re-read your article – you have established that the co-efficient is 0 .62, which is well above the ‘rule of thumb’ significance level of 0.3 and could be considered strong. Physicists may say that what you define as Quantitative Science of History is a kind of Statistical History ( similar with Statistical Physics, etc etc ). Hence, there must exist some sort of Experimental History, where computer and interdisciplinary experiments can refine the most fundamental assumptions. Actually, if by an experiment you mean a “manipulative experiment”, then many fields in physics are not experimental: astrophysics, seismology, climatology, etc. The two quantitative areas of cliodynamics are (1) modeling historical processes, and (2) testing theoretical predictions with historical data. Methodologically there are no differences between cliodynamics and non-experimental fields in physics. By itself the correlation with money and building is quite natural, although it does not explain if money was first and building a result of that/ or the desire for building created the need for money. Very likely the last one, since resources had not dried up. So the mining of silver activity does not explain why there was build. As the first wave being Carthage, obviously does not mean they were building Roman buildings. This by itself proves the disconnection. The connection the article supposed was that of stagflation and falling birth rates. However the building graph does not prov e this, because then it would have declined. Obviously there are sudden breaks between the periods, but I doubt whether this had anything, or solely to do with population numbers. It might reflect the political interest and possibilty of course, to shift attention from the mediterranean to northern Europe. The periods in between were pauses, apart from the last one the ending, not necessarily oppositions. But it’s nice new ways have been found for archeological excavation. 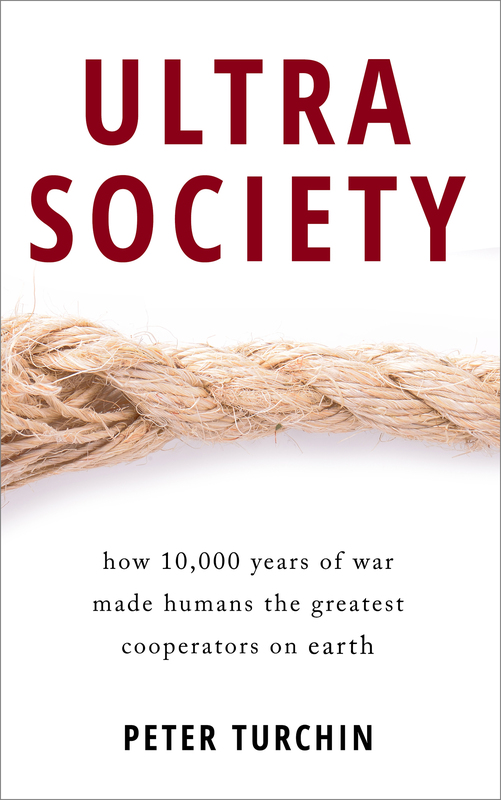 A more detailed and nuanced account, stemming from general cliodynamic theory and buttressed by multiple proxy data can be found in Chapter 7 of our Secular Cycles. I presume the second building wave was due to the incorperation of Christianity, which required a lot of new temples or churches if you like. The Romans did not use slaves, but just payed their workers a salary. 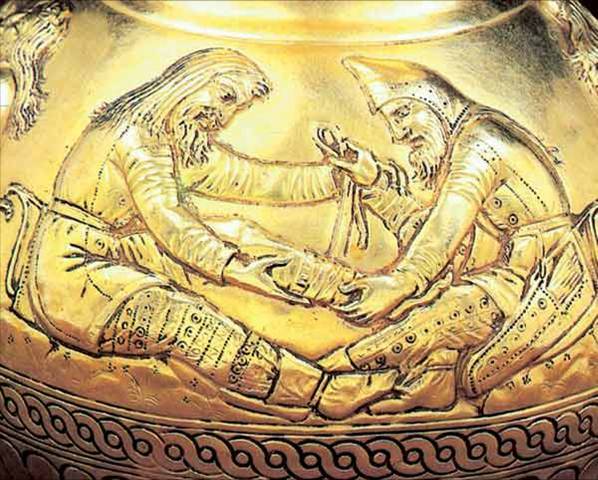 The collapse of the empire was primarily for economic reasons; not just the depletion of silver, because they often chose to use other metals, or use gold for gilding, which led to the famous surface peeling off coins, symbolizing the fall of the empire. The main reason was lack of economic income/ due to very high military expenses in relation to taxing northern European tribes, which in contrast to mediterranean had no rich economic culture. Creating slave satelite states with military forces had always been their core strategy. 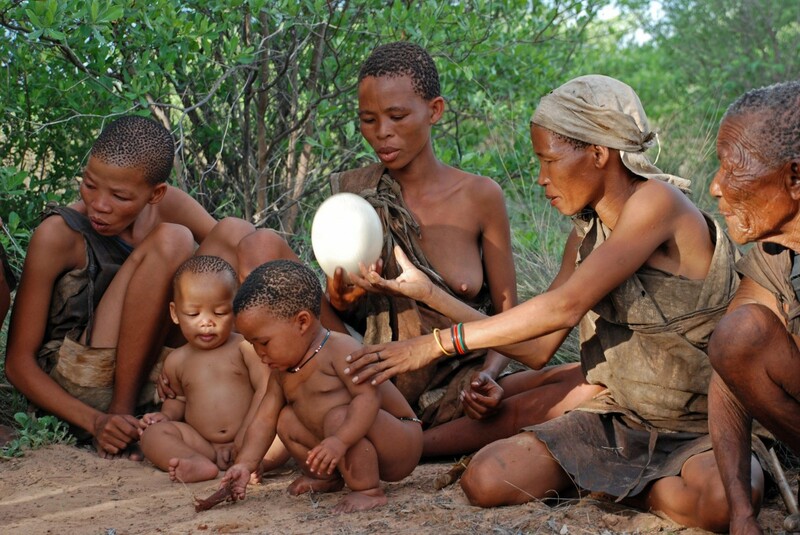 This also led to the sharp decline in building and population because there was no money going around within their home agricultural culture and no young men. It was going around (dying, dissolving) elsewhere. The attempt to concentrate large farms, likely already was a strategy to overcome the problem of lacking workforce and the strong believe in pyramide authority structure. Not sure what you mean by “second wave”. There are five waves (counting two during the Principate). Christian churches played a role only in the last wave which took place during the IV century CE. There’s a nice article that just came out in The Atlantic. I don’t know if the author is aware of SDT but reading it, the parallels to large chunks of Ages of Discord were startling. And I’ll bet there are more people reading that article right now than reading Ages of Discord.